Mazda still had a determination to turn things around, regardless of what happened to the landscape of sports car racing for 1991. As we know, FIA reacted to the lack of entrants upon the 3.5L formula rule changes by allowing previous spec Group C racecars to continue competing, albeit gagged and bound. Mazda saw this as the perfect opportunity to strike again at Le Mans seeing that Nissan would withdraw from the championship to focus on JSPC and IMSA where the regulations weren’t so unfavourable to their current car, and Toyota unwilling to run their current car in handicapped form, took most of the year developing a new platform that adhered to the 3.5L formula. Additionally, the tight fuel consumption rules would be a major hurdle for the heavier, thirsty Mercedes and Jaguars. Not only did Mazdaspeed take the 787 and improve both the powertrain and chassis, but it also restructured its racing organization and formulated a clear and bold plan to win. This plan was centered on optimizing lap time around a minimal fuel usage strategy. The plan was so involved, even the drivers were forced to learn a completely new driving style contrary to their ingrained habits. Nigel Stroud and his team of race engineers worked closely together to establish a laundry list of improvements. In all, there were six major items that would be addressed for the new car. First was reliability. Second, improved fuel economy. Third, design the car as a specialist for the Le Mans circuit, with an emphasis on mid-range speed performance. Fourth was to improve acceleration and cornering performance. Driver comfort was to be made a higher priority. Finally, the team’s information and communication systems needed to be improved. To address the required improvements to acceleration and power, Mazda’s chief of product planning and development demanded 100 additional horsepower out of the existing powerplant. The previous year, Mazda squeezed 30 more horsepower out of its 767B with the entire team working at full capacity towards this goal. 100 horsepower improvement seemed lofty. The engineers managed to increase the output of the 4 rotor powerplant to 700 horsepower which fell short of the goal, but were able to increase the rpm range of usable maximum torque to 3000rpm, a significant achievement in its own right. But if that wasn’t a tall enough order for the Mazdaspeed engineers, they were tasked with also manufacturing a 10-15% improvement in fuel economy at the same time. Clearly, there was only so much more they could achieve through tuning of the engine itself, and looked to simulation for answers. Spark plug and ignition manipulation was one piece to this fuel sipping puzzle. Quicker ignition via an additional spark plug per rotor provided the team with half of their fuel economy goal. The other half came from a change in driving style from their pilots. In low speed corners, it was determined that minimal accelerator pedal input and smooth lines would further reduce the fuel usage. Consultant Jacky Ickx concurred with this strategy and proceeded to convey it to the current driver lineup. The drivers wholeheartedly took to the new fuel saving centric strategy and by working on their driving style, effected the biggest improvement of all. As per Jacky Ickxs request, Mazdaspeed turned control of their European bound 787B to Hugues de Chaunac and his Oreca team. The France based outfit was a successful racing team that claimed wins and championships in several international series, but began to focus its efforts on top tier sports car racing. Together, Ickx, Mazdaspeed team boss Takayoshi Ohashi and Team Oreca politely informed the governing body that they were currently allowed to run at 880kg in IMSA, and the imposed weight penalty for non-formula cars was unacceptable. 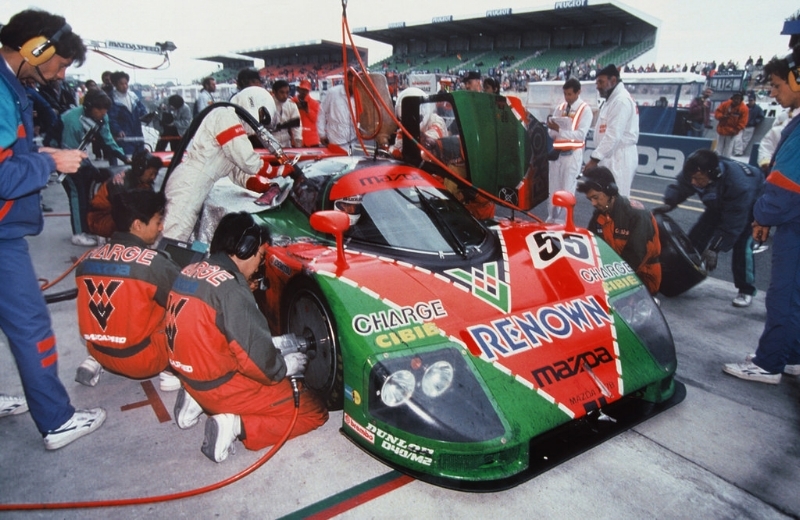 Keen to maintain Mazda as the sole Japanese presence with Nissan and Toyota bowing out for 1991, eventually agreeing to the old weight limit, putting the 787B weight limit at 830kg. The opposition did not protest this exception as Mazda was being largely counted out as a serious contender for both Le Mans and the championship title itself.